Most likely, if you’re a reader of Theme Park University, you want to know how the themed entertainment industry ticks. Readers ask all the time for advice on how to get into the industry or are craving that insider knowledge. There are hundreds of people you can talk to, but rarely do a dozen of them assemble in one room to talk shop. 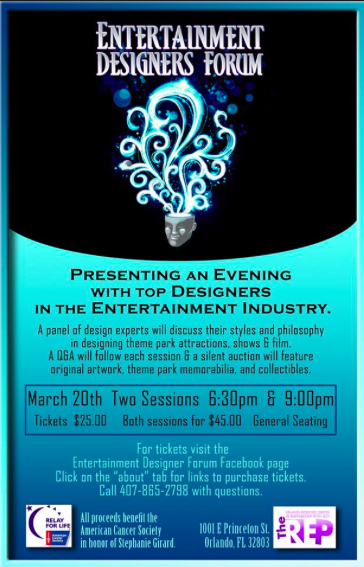 Luckily, if you happen to be in Orlando on Friday, March 20, you can sit in on two panels of the themed industry’s top professionals and hear them tell stories and ask them questions directly. Banks Lee, from Orlando Attractions Magazine, will be hosting two sessions of panelists at 6:30 and 9 p.m. at the Orlando Repertory Theater, which is adjacent to the Orlando Science Center. 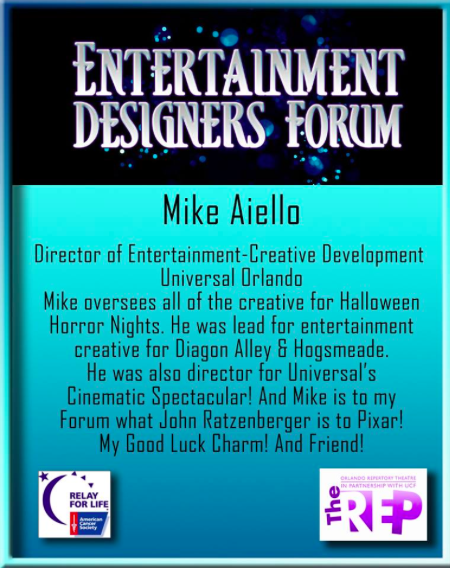 The 6:30 panel will include Mike Aiello, current Director of Entertainment for the Universal Orlando Resort. Aiello has worked on a ton of entertainment for Universal, including Halloween Horror Nights, Cinematic Spectacular and the live shows seen daily in Diagon Alley. In addition, Kim Gromoll will be in attendance at the 6:30 show. Gromoll is an attraction designer and art director at Universal Orlando and has freelanced for companies like Walt Disney World, Sea World and Busch Gardens. He’s worked on anything from parade floats to sets at Halloween Horror Nights. 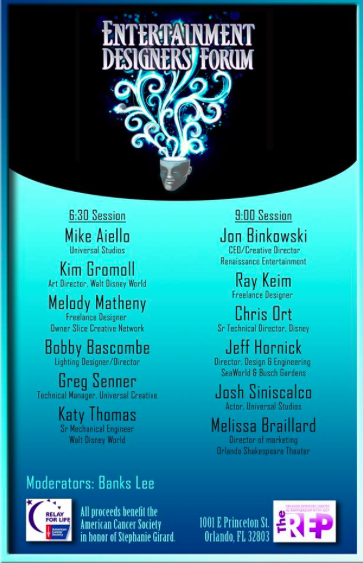 To round out the 6:30 forum will be Melody Mathony, owner of the Slice Creative Network; Bobby Bascombe, a lighting designer for Universal Orlando; Greg Senner, Technical Manager for Universal Orlando and Katy Thomas, Senior Mechanical Engineer at Walt Disney World. At 9 p.m., an entirely new panel will do a completely different presentation. Our buddy Jon Binkowski of Renaissance Entertainment will tell stories of his accomplishments of creating Hard Rock Park, Ghost and Legends of the Queen Mary and most recently, the lagoon show at Chimelong Ocean Kingdom. In addition, the 9 p.m. Entertainment Designers Forum panel will feature Ray Keim, who has worked as an artist for Universal Orlando and creator of the website Haunted Dimensions!, Jeff Hornick, Director of Design and Engineering at Sea World and Busch Gardens will also be on hand, as well as Chris Ort, a Senior Technical Director at Walt Disney World and Josh Siniscalo, an actor at Universal Orlando and Melissa Braillard, who is the Director of Marketing at the Orlando Shakespeare Center. In addition, there will be an auction to benefit the American Cancer Society that features original props from Halloween Horror Nights, original artwork from Disney designers and much more! Tickets to one individual forum are $25 each and if you want to go to both, the cost is $45. 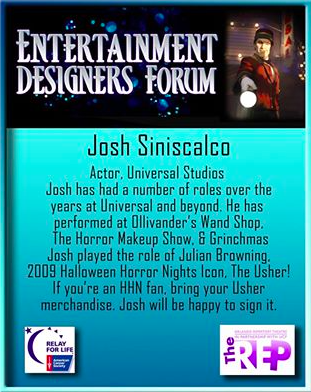 Tickets are on sale at the Entertainment Designers Forum Facebook Page. Just click on the “About” tab and you’ll see three PayPal links to choose which forum (or both) you’d like to attend. Make sure to follow Theme Park University on Twitter and like our Facebook page! Doing any online shopping? Click on any Amazon link on this page and it helps TPU pay the bills. Thanks! This entry was posted in Opportunities, Theme Parks 101 and tagged Entertainment designers forum, Hard Rock Park, Jon Binkowski, Mike Aiello, theme park design, Universal Orlando, Walt Disney World. Bookmark the permalink. Trackbacks are closed, but you can post a comment.